The WPM apologises for the delay in posting due to the remote location of the WPM team, and the delays in finding independent witnesses to help in cross-checking of this extreme situation. This situation is developing and will be updated as more information comes to hand. Indonesian forces have again opened fire on a peaceful Jayapura gathering of about 500 people held by the West Papua National Committee (KNPB), with the shooting of at least 4 demonstrators, and the confirmed death of at least one, on November 26. A total of 15 people are still in serious condition in hospitals around Jayapura with a range of wounds sustained during the live fire dispersal by Indonesian police. In the worst single act of Indonesian state violence since the October 19 2011 crackdown on the Third Papuan Peoples Congress, ongoing sweeps and arrests have been continuing in the time since, causing most members of the KNPB fleeing with their families into the relative safety of the jungle. Unconfirmed reports have also surface that the police have called in the Indonesian Army (TNI) to hunt for KNPB members. Correspondents have also reported to West Papua Media that Indonesian radio stations in Papua have been broadcasting repeated messages from the Indonesian police against all pro-independence forces, starting with the KNPB. “We will use force to break apart the KNPB,” a senior Indonesian Police figure in Papua was heard to say on all Jayapura radio stations early on Wednesday morning. Unconfirmed reports have said that these broadcasts have been repeated hourly across West Papua, with the National Police Chief also issuing warnings that separatism will not be accepted any more. The rally was part of a nationwide day of mobilisations in solidarity with the opening of the Free West Papua Campaign office in Papua New Guinea on November 28. 31 people were arrested by Police in Timika, and 3 arrested in Sorong as KNPB chapters there also organised rallies and prayers to support the opening of the PNG office, which is being held with the involvement of thousands of people throughout Papua New Guinea, including senior members of the PNG Parliament. A rally in Wamena drew several thousand enthusiastic and cheering supporters wearing traditional dress (many bedecked in the banned Morning Star flag) on a long march mass action, led by KNPB Wamena region Chairman, Simion Dabi This was the only rally where police were vastly outnumbered by participants, and police blockaded several points along the route but did not attempt to prevent the rally from going ahead. The Jayapura shooting victim, KNPB activist Matthius Tengget from near Oksibil in the Star Mountains, died of his wounds in custody. However, his body was not retrieved until Wednesday evening after it was dumped into the lake, allegedly by those members of the Brimob paramilitary police units who shot him as they were conducting the dispersal. At time of writing, his family were conducting his funeral in Sentani. “Until now we are still looking for possible victims of yesterday’s mass action who were most presumably shot and disappeared: in their attempt to disperse yesterday’s demonstration, the Police and the Mobile Brigade fired a lot of shots and they chased many demonstrators towards Buper, the Housing Complex III, Ekspo, until Iyoka and all the way to the edge of Sentani Lake,” said Yeimo. Up to 15 people were hospitalised from both gunshots and beatings, including a group of three young women from the Yahukimo dormitory who were savagely beaten by police during their arrests. More reports have also been given that scores of female activists were rounded up and severely beaten by Indonesian police and military officers. The shootings were under the operational field command of the notorious hardliner Deputy Jayapura Police Chief Kiki Kurnia, Abepura area Police commander Deky Hursepunny, together with Jayapura Police Chief Alfred Papare, with the Deputy Papua Police Chief Paulus Waterpauw and Papua Police Chief Tito Karnavian allegedly sighted monitoring the situation from their private Kijang vehicles. Police have predictably launched a propaganda offensive across its tame colonial media networks in West Papua, accusing the KNPB of conducting a riot. However, stringers for West Papua Media, independent witnesses in the busy Waena shopping area, and KNPB spokespeople have all vehemently denied riotous behaviour by the protesters, instead describing how a peaceful sit-in was brutally dispersed under the orders of a cohort of four senior police officers, who have been personally responsible for ordering significant and ongoing human rights abuses against KNPB members. A survivor of Tuesday’s violence fled to Papua New Guinea immediately after the shooting, was directly interviewed by West Papua Media – unidentified for their own safety – and has described how police opened fire without targeting, instead firing indiscriminately into the crowd. Before the shooting, a mass of people had gathered in the field outside the Expo Waena bus terminal and market in front of the Museum, mainly sitting and chatting while listening to speeches. According to the witness, police surrounded the gathering on three sides, and the protest leader Buchtar Tabuni attempted to negotiate with senior police present, including the Alfred Papare, Kiki Kurnia and Deky Hursepunny. As it became clear that police were refusing to negotiate with Tabuni, demonstrators agreed to maintain the peaceful action. According to the witness, Senior police then yelled to the crowd, ordering them to disperse. However, almost immediately, and without further warning of escalation of the threat, Police commanders ordered the front ranks of police in front of the bus terminal to open fire. “When the the shooting started, as I was running, I saw the KapolSek Deky Hursepunny and Kapolresta Alfred Papare standing at the gate, directing his police where to fire,” the witness said. Upon questioning, the witness testified that police initially fired tear gas, but switched very quickly to automatic weapons. The witness also confirmed that instead of individually targeting demonstrators, police seemed to be firing wildly into the crowd, firing indiscriminately. Both the order to open fire without warning, and the subsequent excessive use of firearms against civilians are direct violations of both Indonesian and international law. International Lawyer Jennifer Robinson, Convener of the International Lawyers for West Papua and currently meeting in PNG, told West Papua Media that “This use of excessive force against KNPB members is in breach of international law and Indonesia’s own police regulations on the use of force”. “This latest incident falls within a repeated pattern of the use of excessive and lethal force by Indonesian police against peaceful activists in West Papua which is indicative of a broader state policy. Continued impunity for the police involved is unacceptable and the failure to punish gives rise to command and state responsibility,” Robinson said. Many beatings were meted out on KNPB members by Police during the arrests, with allegations that rifle butts were repeatedly used – a standard practice for the Indonesian police against peaceful demonstrators in Papua. Plain clothes police special forces, described by the witness as “Polisi Preman” (Police gangsters), then continued two days of terror against West Papuan civilians, some in no way connected with the civil resistance movement. This campaign, at time of writing, shows no sign of lessening. “We were running across Waena. Police used many rental cars and were driving around in balaclavas like terrorists, pointing automatic weapons outside their vehicles, and shooting now around Perumnas 1, causing all who could see it to hide in their houses. At the same time a black Avanza stopped in front of us, followed by white and red Avanzas, pointing weapons at all Papuans present. We ran, because we knew we were about to be shot – we had to seek safety with Indonesian transmigrants, who were unaware of the situation,” the witness told West Papua Media wearily. “After police shoot the demonstrators, participants fled to the forest. Police then conducted a brutal sweep, targeting anyone who was wearing dreadlocks, beard, or even wearing sunglasses, and arresting them all,” the witness said. Civilians have fled in panic, and the witness described Waena as deserted when they fled. Families of those at the demonstrations have fled to the jungle. It is not known of normal social functions are continuing, due to the difficulty in getting direct contact with sources in Jayapura. Our witness reported that two days prior to the demonstration, Indonesian army helicopters were searching extensively around the hills in areas that would be the the first point of refuge for civilian after any shooting. The witness survivor believes that this indicated that the shootings by police were premeditated and planned, although West Papua Media has been unable to independently confirm this. However the attacks on protesters occurred just prior to the arrival at Sentani airport of National Police Chief General Sutarman, who has exploited the lack of honest reportage by colonial media to issue more threats against any Papuans who dare dream they can freely express themselves. “We will take firm action against groups or individuals wanting to separate Papua from Indonesia because Papua is part of Indonesia,” State media Antara quoted Sutarman telling the colonial press in Jayapura. Tabloid Jubi reported that the Papua Deputy Police Chief Waterpauw has denied KNPB the right to freedom of expression, permanently. ” I made it clear to the group West Papua National Committee ( KNPB ), immediately stop the steps that are likely to violence . Whatever the form of their intention and desire to perform activities in public hearings, (it) will never be given permission or recommendation to implement it , because we know the purpose of the organisation and their desire is clear , (they) want to form a state , split off and so on , “said Waterpauw on Tuesday ( 26/11 ) evening in Jayapura City police headquarters. “It beggars belief that Karnavian, hoping to please his boss – or more to the point those who would seek to replace the boss with Karnavian – would not be the engine of of a textbook counterinsurgency operation to smash a pesky bunch of separatists. The only problem is, those separatists are unarmed and were conducting a peaceful gathering. It looks like the whole thing was organised for a long time. It is well beyond time those gangsters were held to account,” the observer said, naming Karnavian, Kurnia, Papare and Waterpauw as the perpetrators of massive human rights abuses against Papuan civilians. A total of twenty eight people were arrested, but were released by Wednesday night. KNPB national spokesperson Wim Rocky Medlama told SuaraPapua.com that they are fed up with the police’s actions, which are arrogant and excessive. “This is too excessive. And I think that the police have much to learn. So that they undertake their duties in accordance with the orders”, as quoted in SuaraPapua.com. Olga Hamadi, the coordinator of the Commission for Missing Persons and Victims of Violence (KontraS) Papua, also told SuaraPapua that the police’s actions were excessive and the pattern of arrests should stop. “I’ve only just heard this information. I think that the police are too excessive. Patters of arrests such as this should no longer be necessary. This is included under the rights of each person to express themselves. Moreover this is a democratic country right”, she said in an SMS message sent to Suara Papua, adding that people expressing their views should not be attacked and arrested. “They should be given space. The issue of expressing views in public should not be responded to with arrests and law enforcement. If [the police] are going to be like this it won’t solve the Papuan problem”, said Hamadi. Earlier on Tuesday morning at 8:13 local time. KNPB Secretary-General Ones Suhun was arrested with 6 members of the KNPB (Assa Asso, Okram Wanimbo, Sam Lokobal, Meminda (Mendenas) Sol, Konoru Wenda, and Bonsan Mirin) by Indonesian Police outside the Student dormitories at Putaran Perumnas 3, Waena, Jayapura. They had just begun to hand out leaflets about the afternoon’s peaceful rally calling for the respect of West Papua’s right to self-determination. Most were released by Wednesday night. Reports received by West Papua Media overnight from distressed sources fleeing through the jungle have confirmed that a further series of brutal sweeps and raids had occurred all afternoon and evening on Tuesday and continuing through Wednesday, with unconfirmed reports of Puma helicopters being used to find activists. Hundreds of heavily armed Police were used to raid the offices of the KNPB Secretariat on Tuesday afternoon, also confiscating all the contents and destroying what was left. At least thirty more people were reportedly arrested overnight on the 26th, although this has not been independently verified by West Papua Media, however Buchtar Tabuni was moved by his supporters to a safe location. In Sorong, the KNPB rally was also forcibly broken up by Police, and Marthinus Yohame (regional Chairman of KNPB), Kantius Heselo (Vice chair KNPB Sorong), Natalis Surabut Gebby Mambrasar, Nius Loho and Welem Surabut, were arrested for holding the rally, but were released overnight. Biak also saw its KNPB rally broken up police, with several arrests reported and injuries sustained. KNPB Biak Chairman Apollos Sroyer reported to West Papua Media that the actions of police were again excessive in preventing a prayer session from going ahead, using scores of police and troops to blockade access to the church. Police dispersed the crowd later in the afternoon. 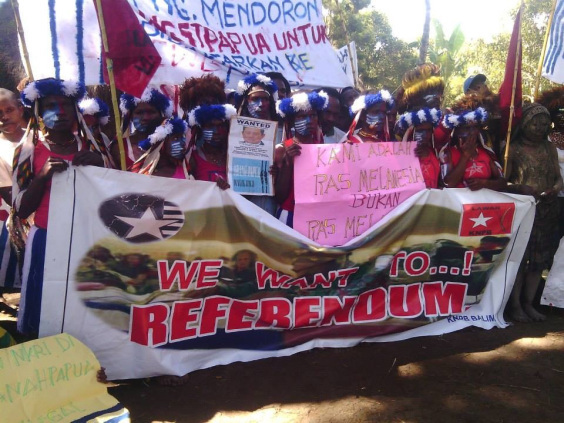 In Manokwari, KNPB members were also banned from holding any events in solidarity with the PNG office opening, but were able to negotiate with the hundreds of riot police, and the rally went ahead with several hundred participants, dispersing peacefully after a prayer in the late afternoon. In remote Yahukimo in the highlands, an action supported by KNPB Yakuhimo in support of the IPWP/ILWP meeting at Parliament Haus in PNG on Nov 27, and FWPPNG office opening in PNG was held in front of the Ruko Putra store. The action was carried out in face of threats from Brimob officers and a platoon of fully armed TNI of Kodim Wamena 1702 (Battalion 752), and also 15 Kopassus special forces brought in from Jakarta. They were backed up by a large but unknown number of police from from POLRES Dekei Yahukimo under the command of the local Polresta Eliakin Ap. The forces presence was was requested by Ones Pahabol, the Yahukimo Bupati (District Head). Ones Pahabol is also the local head of the Committee of the 17th District of the GIDI (Indonesian Evangelical Church), who is considered extremely pro-Indonesian. According to KNPB sources in Yahukimo, Pahabol’s reason for requesting military support was to break up any KNPB demonstration, and he ordered the dispersal of the KNPB activists because he was prohibiting the expression of the KNPB in public. However the KNPB reported that even though the local government, police and local church committee refused to give permission for the rally to go ahead, the district head of gidi church did give them permission. However the KNPB commented that it was “as if the church were giving permission to the military to kill their parishioners. Despite this military threat we give our full support to the IPWP meetings happening in PNG on the 27th – 29th.” said a KNPB spokesperson from Yahukimo. In addition, independent media website Suara Papua has been subjected to a denial of service attack, after they published accounts conflicting from the official police version of the story. It is believed by many season observers on cyber conflict in Indonesia, that this is the work of a shadowy cyber- division of the Indonesian police trained and funded by the Australian government, despite the fake outrage generated by the Canberra-Jakarta spy scandal. In news to hand just before publication, two more bodies have been recovered from around Jayapura suffering gunshot wounds, though it is unconfirmed whether they were victims of the November 26 shootings, or further murders by security forces. A highly credible source reported to West Papua Media that on November 27 at 3.30pm, a Papuan youth named Ottis Membilang (17), was shot by two TNI soldiers. According to witnesses, Membilang was standing on the side of the road in front if his home near the Mega store at Waena when 2 TNI members arrived in an unidentified vehicle and shot and killed him for no apparent reason. This is within metres of the area that West Papua Media’s witnessing survivor of November 26′s violence described troops and police driving around in Avanzas, wearing balaclavas and threatening to shoot all nearby Papuans. At the time that the first victim Mathius Tengget was being buried by his family, another body was found at Koya Barat (West Koya), at Wlara Tami near Skouw. KNPB sources have yet to confirmed if the body belongs to one of those missing since Tuesday’s brutality. The Tami River has long been a notorious dumping ground for victims of the Indonesian security forces’ Ninjas, as the river after rain sweeps all bodies far out into the Pacific Ocean into shark infested waters.